The origins of this public bank can be traced back to the historical "Monti frumentari" of the eighteenth century at the time of the Savoy. 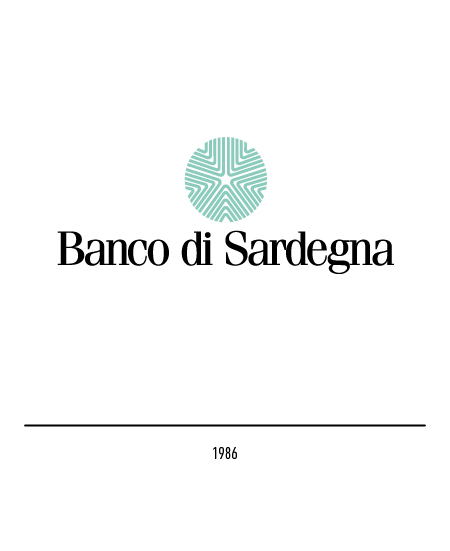 It is out of these rural banks with their strong and durable ties in the islands farming communities that the modern-day "Banco di Sardegna" was to evolve. 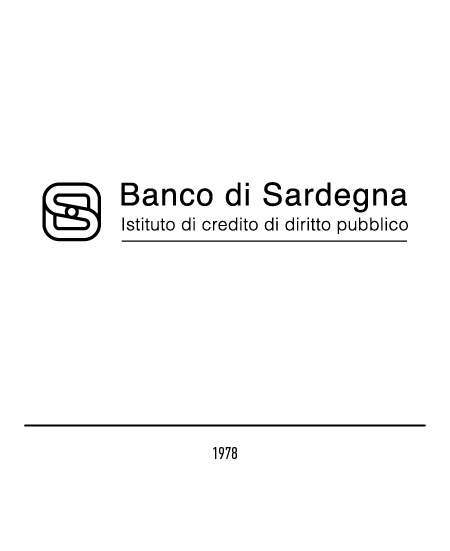 Set up in Cagliari in 1955, the Bank had its first trade-mark designed by one of Olivetti's top-most designers, Giovanni Pintori, only in 1978. The two initials "B" and "S" appear to be overlapping but are in fact interdependent and rotate around a pivot that constitutes the optic centre of the image. In 1986 a new trade-mark wholly unrelated to the former was adopted. It portrays an ancient baked-clay tool, the so-called "pintadera", employed in the Nuragic (local Megalithic) Age to decorate and "brand" loaves of bread. Loaves and cakes were so marked as they constituted currency at the time and were hence used in economic transactions as a means of exchange. 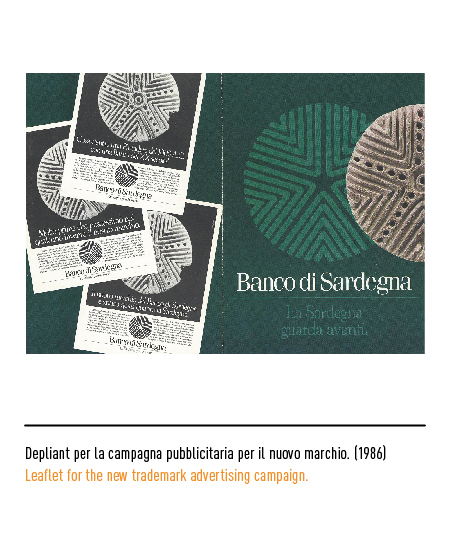 The "pintadera" symbol was chosen to embellish the Bank's trade-mark as it is associated with one of the most deep-rooted traditions of Sardinia and at the same time it recalls the Bank's origins in the already mentioned "Monti frumentari". These "banks" were originally set up in 1624 by order of the King of Spain, Phillip IV, for the granting of agrarian loans in kind. 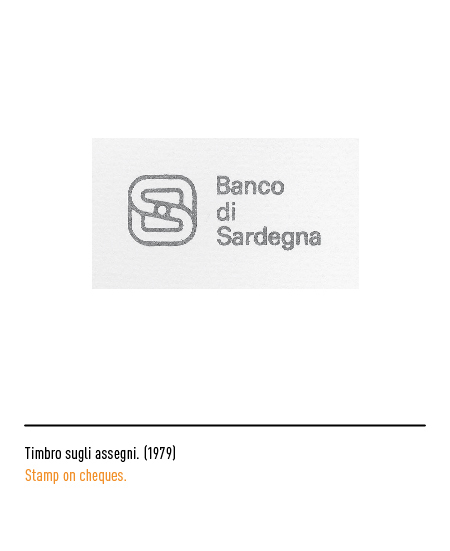 The "pintadera" used for the design of the Bank's new trade-mark is indeed the most renowned of its kind from the Nuragic Age in Sardinia. 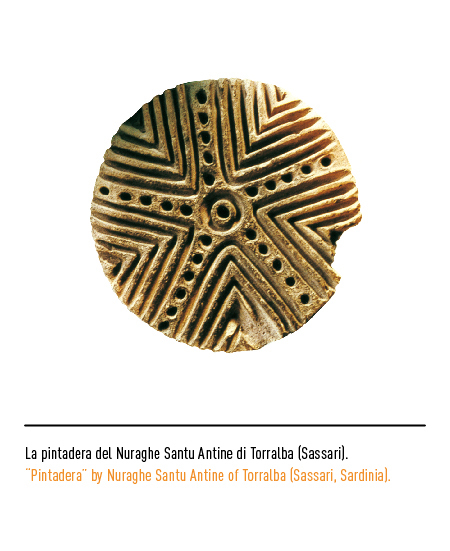 It was excavated in a deep layer of a dig at the Nuraghe of Santu Antine at Torralba in the Province of Sassari. It comprises five sets of angles inscribed one inside the other separated by five ridge-lines decorated by large dots that move out from a concentric circle to a hole drilled in the hand grip. 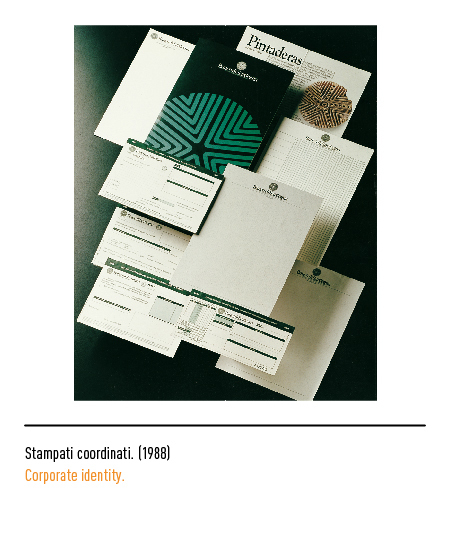 Maurizio di Robilant's design has essentialised the lines and deleted the decorative dots. The logotype in Fenice lettering appears in conjunction with the graphic design in a number of versions. Aldo Colonetti, “Il nuovo capitale e le sue immagini”, in Linea Grafica, n. 3, maggio 1987, Azzurra Editrice, Milano. 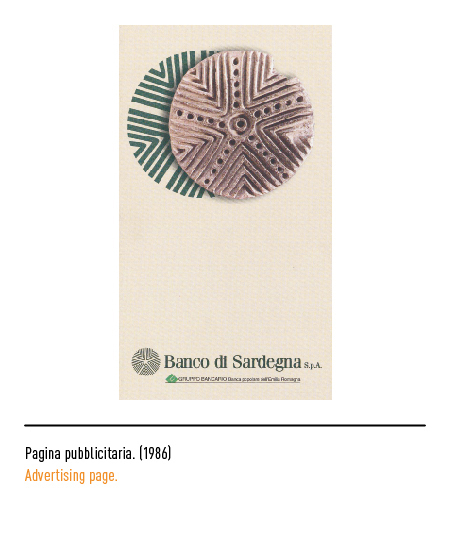 Salvatore Palita, “Grafica e comunicazione visiva in Sardegna”, n. 10/11, dicembre 1990 / luglio 1991, Edizioni 10/17, Salerno.